Is it here? Can it be? Why, yes, YES! The day has finally arrived! Co-hosted by Mark Koopmans, Morgan Shamy, Stephen Tremp, and yours truly, we wish to celebrate the next few days by giving our most excellent Ninja Captain the high honors of a good 'ol fashioned holiday roast (all in good fun, mind you). How do you roast this host to perfection? Follow these prompts and let the imagination soar! In +/- 20 words, what does Alex look like? FIRST PLACE: A signed copy of CassaStar. GRAND PRIZE*: A picture of Alex and a download of him playing the guitar (on the condition that his picture is NOT to be shared online). And while I'm co-hosting, I'm not eligable to win a prize ... but, come on. This is a once is a lifetime opportunity. I have to participate. So, without further warning, here's a flash fiction, 200 words, using all those prompts! Who is Cavanaugh? A Ninja? A Cosbolt pilot? Aside from his writing, guitar-strumming, and foundering of the blogosphere's official security blanket known as IWSG, I can only imagine! He's always there, supportive, at times better than most - reminds me of loyal NPCs who never become toast. But then his comments, how fast they're fall'n - ten seconds, sincere - I can't doubt he read the whole column! Who reads that fast? No one I know - unless his processor is slicker than grass? That would mean he's not human ... or a bottle of cumin. Hey, I got it! Now it makes sense! Alex Cavanaugh = Artificial Intelligence! If this is true, his secret's safe with me - I bet he'd sound like Stephen Hawking if he narrated a documentary. His mission? Assimilate us all, in a good way, not bad, like Mr. Darth Maul (he's only half the man he was, after all). While he may look like an Intel processor core, AJC writes great books - and so I want more. Don't forget Mrs. Cavanaugh, who assimilated him before us. Cheers to The Mrs., the queen of this festivus! Happy Holidays, Mr. and Mrs. Cavanaugh! Thanks for being great sports. And also great friends. If you need someone reliable on your zombie survival team, you can count on me, which leads me to Clue #4, and I'll let this link do the work for me - the topic's a little "dicey," and not every item is suited for everyone - so pick something up for yourself and let it be an "extension" of yourself. There's still two weeks left to join in on the next big hop, which can include your chance to win a complete blog makeover. Since I announced it, we had a few more awesome members join The Cosmic Laire. Welcome aboard, newies! Update: Writing picked up, Undead got a preface and a few more chapters, and Woven: Part 2 (not actual title) has begun (for no reason ... in particular ...)! Aiming for a solid 10K this week to get this WiP to the midway point! Super long post, huh? Well, it's over now ... and if you're reading this after all of that, thanks for sticking with me. You're super-duper troopers! Soooo, how was your weekend? Stayed at home? Watched the snow? Checked out that new restaurant in town? What up, peeps? I'm David, and who's ready to go Into Darkness? Thanks again so much, David. I'm honored and will laugh myself silly today. Cheers to Alex-- he indeed contributes so much to the blogland. 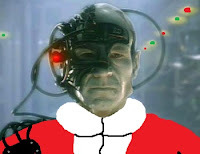 Alex the borg? Haha, I love it! CONGRATS on the WIP... KEEP GOING KID! Good luck with the 10000 words! Dang, I never thought of a video. I figured someone would do one, but dang I shoulda. Well done, David. Your honourable mention was awesome. Loved the free verse! Artificial intelligence...hmmm... interesting concept - and viable! I also enjoyed your verse, and the clever pictures. Thanks for hosting this fabulous fest! David, that was great! You would have won hands down! I loved the Star Trek trailer. I kind of wonder if the villain is Khan cause he kind of seems like he could be. And I absolutely love reading all of these entries regarding Alex. They wouldn't be nearly so entertaining were I not familiar with him lol. The Borg...oh my! Is that even flattering? They were responsible for the decimation of countless races through the universe! Wow, it all makes sense now! He has to be artificial. It's okay, though. He's our Ninja Captain no matter what! Great entry! Excellent post and I am so ready for Into Darkness! Thanks for this great blog hop. It's been fun! I'm considering your Borg theory...either that or he's got a bunch of clones. Thanks for hosting this blogfest! It's a ton of fun! Alex as Borg... very intriguing thought as he seems to be everywhere. Can't wait for the new Star trek and congrats on getting the writing going. Okay, I'll buy this one. Alex could be a Borg...maybe. Thanks for hosting this! I knew he had to be of artificial intelligence. How else can he reply to blog posts within seconds of posting them? Loved your tribute! If he's AI his empathy processors are extremely advanced! Great tribute! Cool entry :-) And I'm impressed with your 10,000 word goal - hope you make it! Thanks for hosting this hop, it's been so fun and Alex deserves it. I love your flash, it really does explain Alex's ninja speed through the interwebz. Congrats on your writing progress, too. That's wonderful. You've been busy. I went dancing to bluegrass w/my girlfriends this weekend, which was super fun and I'm taking days off so I won't lose them at the end of the year. Editing and blogging. Woo hoo! Perfect images for the season and the Alex Fest! Wonderful job. Borg Alex and the Mrs. <3 it! Thanks for co-hosting, David!! So cool that you're doing this to support Alex! Way cool David :) I think you got it right with the AI and Borg. I'm still smiling. And I did stay home all weekend and play with my new computer. Thanks for hosting this blogfest, it's been such fun and I love reading everyone's posts and takes on what Alex looks like. You're not the first to say he's not human, he's a computer and, now I come to think about it I think you're right! The gamer in me came out at your comment about Alex reminding you of loyal NPCs who never become toast. I laughed out loud. But it's so true!!! That was hilarious, David. I bet you would've won had you been eligible! And I'm really looking forward to the Star Trek movie. Love your Star Trek teaser and all the fun during Alexfest. Oh, my heck. I love the TNG theme. I love the trailer, but if that's Kahn, I'm trying to figure out his vengeance thing in the new altered universe thingy . . . I think he has a whole army of Borg. This is so much fun. Thanks for organizing and for the Star Trek trailer. Can't wait. Seems these tributes keep getting better. I'm very impressed with your theory in rhyme. And is that Alex, too, in the trailer? I wouldn't be surprised. Thanks for co-hosting a great, well earned blogfest, David. Stopping by from the Cheers Alex Blogfest. Great theory! Okay the pix of Mr. & Mrs. C...hilarious. Thx for hosting! I can definitely imagine AJC = AI. ;) Best we don't shout it too loudly in case the govt comes to kidnap him for experiments! I love your flash fiction piece, David! I think Alex skims our posts because he has so many blogs to visit every day. I don't know how he keeps up! Alex has magic powers or something, but like he has said before, he may or may not have clones. Thank you Ninja Alex! Awesome post on Alex. Very creative. WOW! and it rhymes. Festivus? Great post. Thanks for hosting this awesome sauce. Thanks for putting together this much deserved party for Alex. He deserves it! 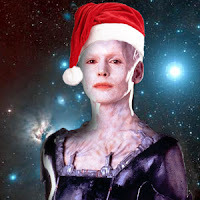 Love your Borg take...I'm a Trekkie through and through. Nice to see my first glimpse of the new JJ Abrams installment. P.S Any fan of Alex AND JJ Abrams is a friend of mine. Thanks for your visit. I'm your new devoted follower. Hehehe! Great post! Sometimes I really think Alex must be an AI. Thanks for hosting this great blogfest. Not gonna lie: the Stephen Hawking line killed me... Thanks so much for co-hosting this super fun fest and allowing us all an outlet to give praise where praise is due! Thanks for dropping by my blog today! It was great to meetcha! I recently saw the new Star trek trailer, and though it oddly reminds me of the Avengers, I think that it looks like it will be a great film. I'm excited! Writing is killing me slowly, but I'm continuing with smiles! So that's what Mr. And Mrs C. look like. Pretty much as I expected. Love the pictures. And yes, even if Alex was half the man he is, it's still more than twice the man I could ever hope to be. Liked that trailer. Very nice of the four of you to celebrate a fellow blogger, one who gives back. You could be right about the AI and Alex. HA! Artificial intelligence, eh? That would explain how Alex manages to get around as much as he does! Hah! We all knew Alex couldn't be completely human. No way could a human be in so many places at once every single day! Great roast, David. And thank you so much for hosting! Great post and blog. Think you and Alex must be kindred spirits of some sort. That explains so much! He's faster than a speeding bullet at commenting. I knew he couldn't be completely human! Haha. 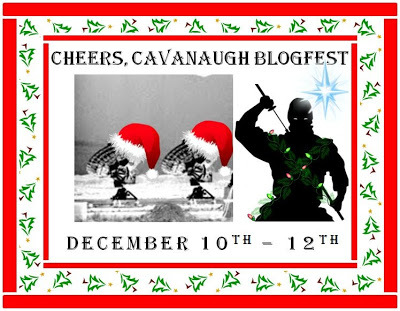 Thanks for helping to organize this blogfest! It's been a blast. AI? I think I could really believe that. Thanks so much for co-hosting. This has been such a fun bloghop! Love it! First, Arlee Bird says Alex is a clone, and you say he's a part of the collective. One thing is for sure, Alex gets things done that is humanely impossible. Am I the only one who doesn't know what a cosbolt is? I keep reading about it on the Cheers to Alex blogs. I assume it's a plane, but really don't know. I guess I'm not reading Alex's blog enough. I'm sure the answer is there. LOL, Suzi, I don't know what a cosbolt is, either, but was afraid to announce that deficit publicly. I love the picture of Mrs. C. She has just the right amount of stoicism and dignity to balance Mr. C.
Can't wait for the new Star Trek!! Too funny and I think you may be onto something with Alex. AI. Thanks for the warm welcome.